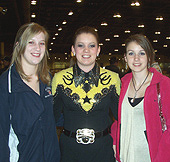 Juliann Zach of North Dakota State (center) had both of her sisters on hand when she competed in individual beginner western horsemanship at IHSA Nationals in Lexington, Kentucky on May 9th. The Bison freshman from Rocholt, South Dakota went on to place seventh in the division. What's this? A Zone 1, Region 1 alumni rider on the Zone 9, Region 3 page? 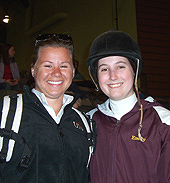 2008 University of Connecticut graduate Amy Kriwitsky (on left) is from the same area as University of Minnesota (at Twin Cities) freshman Emily Pope (on right). From Golden's Bridge, New York, Pope was one of two freshman in a field of 31 riders competing in the Cacchione Cup competition at IHSA Nationals May 6th through 8th. Though Pope finished out of the top ten she will hopefully be back for several more Cacchione rides at future IHSA Nationals shows. Schools competing in Zone 9, Region 3 during the 2009-2010 school year: Bethany Lutheran College, Carleton College, Ellsworth Community College, Gustavus Adolphus College, North Dakota State University, Ripon College, Rochester Community and Technical College, South Dakota State University, St. Cloud State University, University of Minnesota at Crookston, University of Minnesota - Twin Cities, University of Wisconsin at Eau Claire, University of Wisconsin at LaCrosse, University of Wisconsin at Milwaukee, University of Wisconsin at Madison and University of Wisconsin at River Falls.